Like the rest of Korea, Seoul has four distinct seasons, which means the landscape changes considerably throughout the year. 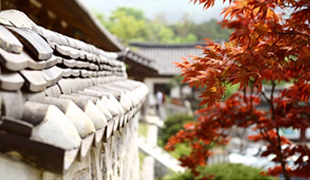 This unique climate is deeply embedded within Korea’s cultural fabric. Seoul’s average temperature is 12.9°C, and spring begins around March, when the entire city bursts into flowers. Many Seoulites enjoy strolling around Yeouido or other green spaces throughout the city that are filled with an astonishing display of cherry blossoms, forsythias, azaleas, and magnolias. This is the season when the temperature drops sharply after nightfall. Those planning to visit Seoul at this time must remember to pack suitable clothing. A pair of sunglasses and a mask to keep you safe from inhaling the yellow dust that is carried over from China during the spring are essential. The air can be extremely dry, so take extra care if you have sensitive skin or a sore throat. Seoul’s long, hot, and humid summer is only interrupted by sporadic monsoon rains in June and July. If you find Seoul somewhat quiet during this period, that’s because many Koreans go on vacation at this time of year. 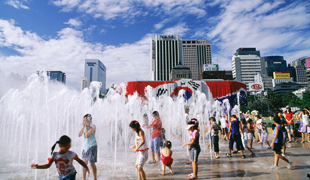 You will also find people gathered around the water fountain in front of Gwanghwamun Square or under a bridge along the Hangang (River). Banpodaegyo (Bridge) is a popular spot that offers a fantastic view of the city. Seoul’s pleasant autumn season lasts from September to November. Seoul is filled with bright autumnal colors at this time of year. It is the harvest season, which is celebrated by paying tribute to the ancestral deities and spirits. It is also the season in which people prepare for the imminent winter. In addition, Seoul Street Art Festival (Hi Seoul Festival), one of Seoul’s major festivals, is held during this period. During this time, Changgyeonggung Palace and Gyeongbokgung Palace are also open to the public in the evenings, as well as the Seoul Lantern Festival, which lights up the streets at night, offering many spectacles. Due to the strong influence of icy air from the North, winter is quite cold in Seoul. This is when public areas all over Seoul open skating rinks. The days become markedly shorter, and you will see Seoulites busily going about their business wrapped up against the cold under myriad flashy neon lights.